Memorial Day, initially referred to as Decoration Day, is always celebrated on the last Monday of the month of May. It is a day to remember those who died while in service to our nation. Memorial Day was first observed on May 30, 1868. 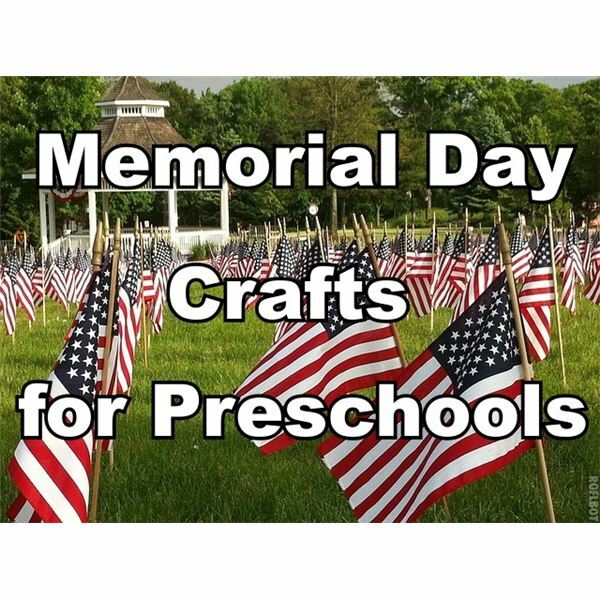 Little learners can celebrate this day of remembrance by creating one or both of these preschool craft Memorial Day activities. On Memorial Day, we fly our nation's flag high and with pride. Preschoolers can also take part in this tradition by creating their own American flags to display and be proud of on Memorial Day. This preschool craft also gives teachers the chance to share a little information about our nation's flag, such as how many stripes it has, how many stars it has and what the stars and stripes represent. To complete this preschool craft, you will need 12 Popsicle stocks for each child, glue (a non-toxic glue that dries clear), three paintbrushes for each child, blue construction paper, safety scissors, a white gel pen and white and red paint (non-toxic and washable, such as Tempera paint). Have the students begin with the white and red paint, the Popsicle sticks and their paintbrushes. Instruct them to paint four of the sticks white and five of the sticks red. Assemble the sticks in alternating colors to create a rectangle. Help each child break two unpainted craft sticks so they are the same height as the painted sticks when placed vertically onto the rectangle. Glue one broken stick vertically along the middle of the backs of the sticks and the other behind the right edge to hold the painted sticks in place. Glue the final unpainted stick vertically behind the left edge of the flag to serve as a handle. Next, help the children use the safety scissors to cut one small square of blue construction paper each. Have them use the white gel pen to draw six stars (three rows of three) onto the small square of blue construction paper. Once the gel pen has dried, help the students glue the blue construction paper square with the stars on it onto the upper left-hand of the flag. Once the glue dries, this preschool Memorial Day craft is complete. This craft will not only allow children to be creative, but it will also help them learn how to draw a five-pointed star. As the teacher is demonstrating how to draw a five-pointed star, she can also briefly discuss that Betsy Ross created the first United States flag. For this preschool craft, you will need one piece of white construction paper per student, safety scissors, a pencil for each student, and red, white, blue and yellow crayons for all students. Help each student draw a star using their pencil on their piece of white construction paper. This star should use most of the paper. Once the stars are drawn, help each student cut out their star with a pair of safety scissors. Once they cut them out, allow each student to use all four crayon colors to decorate their star as they please. Then, hang these stars all around the classroom to help decorate for Memorial Day. These preschool craft Memorial Day crafts will allow students to be creative while learning a little bit about Memorial Day and our nation's flag. They can be used with a Memorial Day theme or as an independent activity for the holiday.